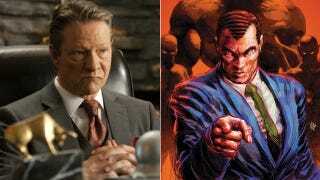 Chris Cooper has signed on to play Norman Osborn, a.k.a. the Green Goblin, in Marc Webb's sequel to The Amazing Spider-Man. Cooper joins Dane DeHaan as Osborn's son Harry, Jamie Foxx as Electro, Paul Giamatti as the Rhino (man, it's never not weird typing that), Emma Stone as Gwen Stacy, Shailene Woodley as Mary Jane Watson, and Felicity Jones possibly as the thief Black Cat... for now. There could be more casting announcements coming. Who knows? Clearly, Webb is trying to pack as many characters into ASM2 as possible. There's only one way this movie doesn't end up a complete mess — and that's if Webb is assembling the Sinister Six. In which case it still could be a complete mess, but it would probably be a massively entertaining mess, at least.